Integer linear programming (ILP) is a powerful and versatile technique for framing and solving hard optimization problems of many types. In the last several years, ILP has become widely used in computational biology, although predominantly by computationally and mathematically trained researchers, such as Bernard Moret. In an effort to reach a broader set of researchers, this chapter begins with an introduction to ILP, illustrated by the phenomena of cliques and independent sets in biological graphs. Then, the focus shifts to new research results on the use of ILP to solve traveling salesman problems, using compact ILP formulations. Such formulations have been largely declared useless in the optimization literature. 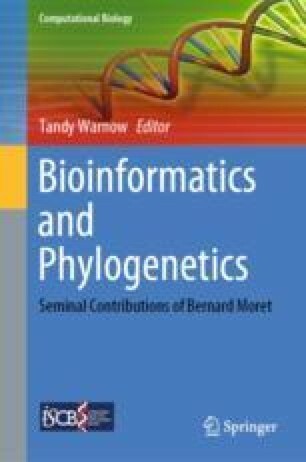 However, in this chapter, I argue that the correct compact formulation can be very effective for problems of the size and structure that arise in computational biology. These empirical results, and some additional arguments, then bring into question the relevance of the concept of strength of an ILP formulation as a predictor of the speed that it will be solved. This research was supported by NSF grant 1528234. The research was done partly while on sabbatical at the Simons Institute for Computational Theory, UC Berkeley. I would also like to thank Thong Le for help on understanding proofs about strength; Jim Orlin, T. L. Magnanti, and David Shmoys for helpful communications. Finally, I thank Tandy Warnow, Mohammed El-Kebir, and the anonymous reviewers who provided many helpful suggestions. See Table 15.1 for results of experiments with different compact TSP formulations on a range of random graphs that differ in the number of nodes they contain, and their edge density. The entry in the column for “gap” is empty if the computation ran to completion, and otherwise is the gap when the computation was terminated. An entry for “Time” is the time at completion or termination of the ILP computation; and an entry for “LP-Opt” gives the optimal cost of the LP-relaxation of the TS problem, as reported by Gurobi. The LP-Opt cost can be compared to the cost indicated next to the problem ID, as a measure of the strength of the ILP formulation.19 These LP-opt values can also be compared to each other to validate known theory about the strength of ILP formulations, or to question the relevance of that theory. This is discussed in Sect. 15.11.